This new Combination Cylinder by Abus is opened using either up to 6 digit combination code, an encrypted electronic key, or proximity chip. 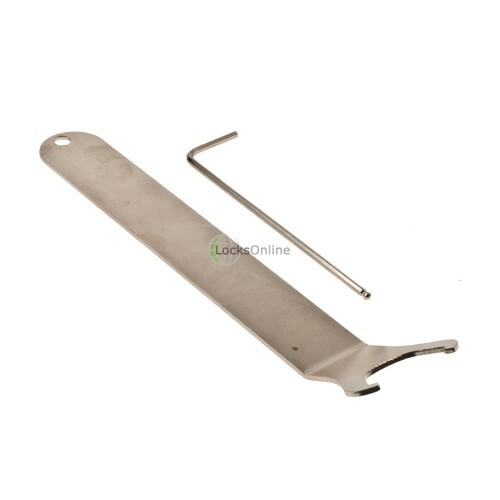 The cylinder body is made from stainless steel and is really built to last. 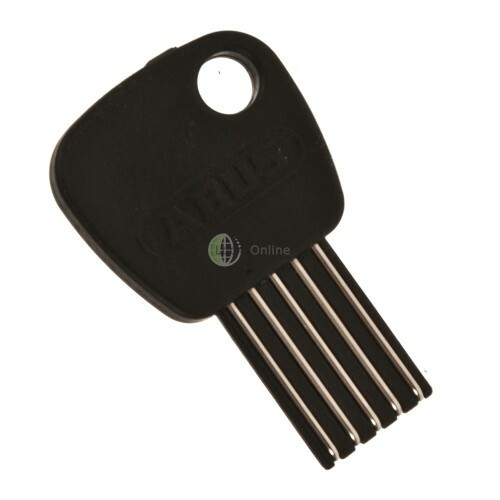 Particularly useful in situations where the loss of keys may become an issue, such as in offices, hotels, or other situations where multiple people may be in possession of keys, therefore increasing the chances of ongoing costs of replacing keys. 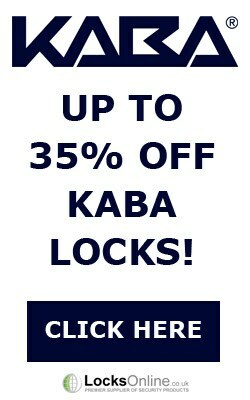 ABUS is a German manufacturer of preventative security technology as well as a market leader in padlocks and bike locks. August Bremicker & Söhne founded the company in Wetter, Volmarstein, Germany in1924. The company is still family owned and continues to be managed by the 2nd generation Bremicker family. 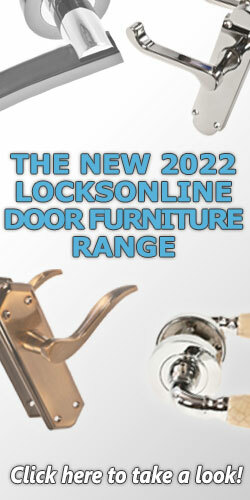 Over the last 90 years, the range of products has increased considerably and today, alongside padlocks, ABUS produce a variety of products including smoke alarms, video surveillance systems, bike and boat security products, alarms and locking systems, including this new and intuitive combination wheel cylinder. Being IP44 rated the combination code cylinder is suitable for use on most internal doors but we would not recommend use on external doors where it would be exposed to the elements or harsh weather conditions. 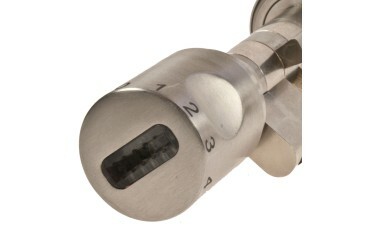 For main entrances we would recommend perhaps considering a typically more externally graded combination codelock, and use these as an easier and more stylish internal combination lock solution. 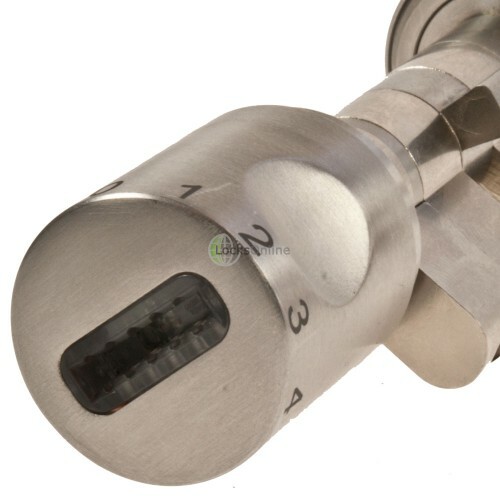 The combination code euro cylinder can be fitted to almost any door that uses a Euro style cylinder without the need for drilling or chiselling the door. This is one of the big advantages with these cylinders - there's nothing more required than to replace an existing cylinder with one of these. It really could not be simpler! Similarly, using the combination cylinder lock could not be easier. You simply rotate the dial and press for each number that your code is. On the last number, the cylinder will acknowledge the correct code and then by turning the cylinder you will be able to open the lock. The Combination code lock is manufactured to order in various sizes from 60mm overall to 150mm overall in 5mm increments. These cylinders are built to order so please allow up to 15 working days for delivery. Commercial office buildings, retailers of all types, banks, insurance companies, manufacturing and industrial sites. 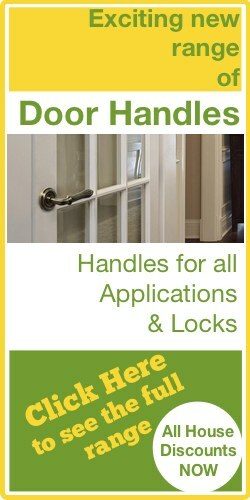 Domestic, Housing security upgrades and multiple users applications. Educational, universities, university housing, schools, research institutes, academies, nurseries. Healthcare environments, hospitals,clinics, elderly homes, assisted living, doctor/dentist offices, home care,social centres and group housing. Hospitality, Hotels, guest accommodations, vacation properties and holiday resorts. Leisure & Entertainment, sports centres, sports stadiums, swimming pools, health clubs, cinemas, theatres,museums, amusement parks and restaurants. Public administration buildings, town and city council owned buildings, ministries, parliaments, military bases,police and court facilities. Transport, Airports, train, metro, bus stations, ports, warehousing and distribution centres. 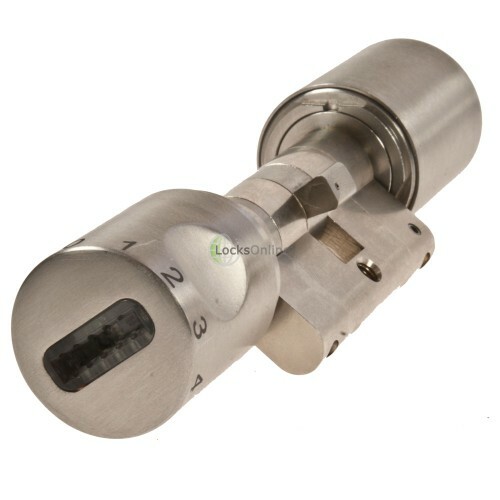 The CodeLoxx cylinder can be used as a simple combination door lock for a basic level of security or with the software and transfer device for data logging and a greater level of security and access control. The CLX-LCA-S standard combination CodeLoxx is an electronic double thumb turn cylinder with chip key reader and combination code for code input. It comes complete with a 3V Lithium battery (CR2) which will give approx. 60,000 openings. A comprehensive installation and user manual are also included. If used with the software and data transfer, the cylinder will record the last 1000 events without a time and date stamp. 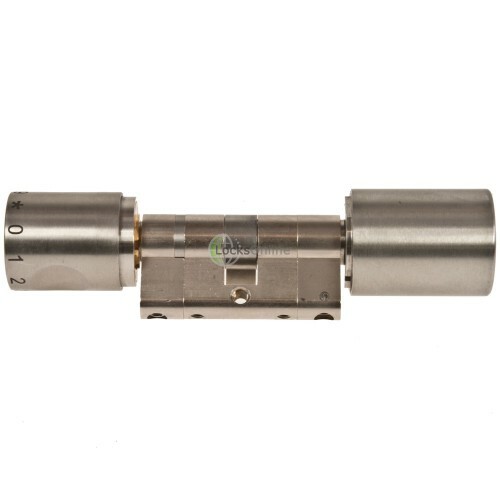 For the recording of the last 1000 events with a time and date stamp; 30-week profile, six-year profile the CLX-LCA-SP cylinder needs to be ordered. For use with alarm and other access control systems, the CLX-LCA-AFP (AEBasic) needs to be ordered along with the AEB-AP Evaluation Unit and can be controlled by either a wired or wireless alarm system. The Codeloxx is easy and simple to fit. Read through the instruction booklet and using the CLX Z WS toolkit, remove the external knob or thumb turn. Insert cylinder into the door then re assemble the external knob ensuring the grub screws are tight. Programme the desired 4, 5 or 6 digit code into the CodeLoxx head by using the chip key and following instructions in the manual. 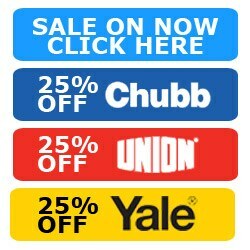 Adding or deleting combination codes follows similar easy step by step instructions. This process should take no more than a few minutes. For data transfer and complete access control, the transfer device and software is needed for managing users via a PC or laptop. 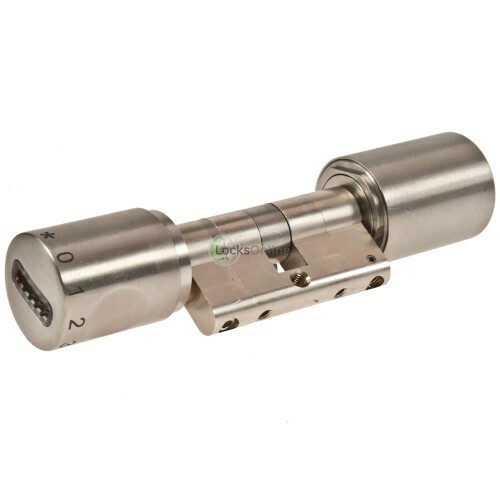 The cylinder can also be overridden or opened by the numbered chip key. Please note: when ordering, please double-check the sizes specified as they are manufactured specially as per the specification on your order and therefore cannot be returned.